SOFTBALL: Despite being a relative newcomer to the sport of softball, 10-year-old Braylen Harvey has excelled enough to warrant a spot on a representative side. Braylen travelled to Toowoomba on April 1 to represent the Granite Belt in tryouts for the Darling Downs 10-12 years boys' team. Midway through the day he suffered an injury to his arm, but fought back and was selected as a pitcher for the team, who'll head to Mackay later this year. The youngster said it was a great new experience. "I really enjoyed just doing everything. I met some new friends, too,” he said. When it came time for selectors to pick a side, Braylen's name was first cab off the rank. Local girls Emily Carnell and Zahli Lawer were also hand-picked on the day to represent the girls' Darling Downs team. "I already knew that Emily and Zahli made the girls' team so I was hoping that Coen (Cook) and I made the boys' team as well,” Braylen said. Braylen's father, Justin, took his son up on the day and he and wife Jodie were both thrilled for their son's success. "We are very proud of his efforts on the day and with making the team,” Jodie said. "His persistence on the field that day was commendable after his injury. Unfortunately, on the day Braylen got injured by a softball bat hitting his arm in the skills section before lunch, with fears it may be fractured. After the lunch break he played on and battled through the pain. "This obviously paid off for him. When he was home he got it seen to and it wasn't fractured, luckily,” Jodie said. 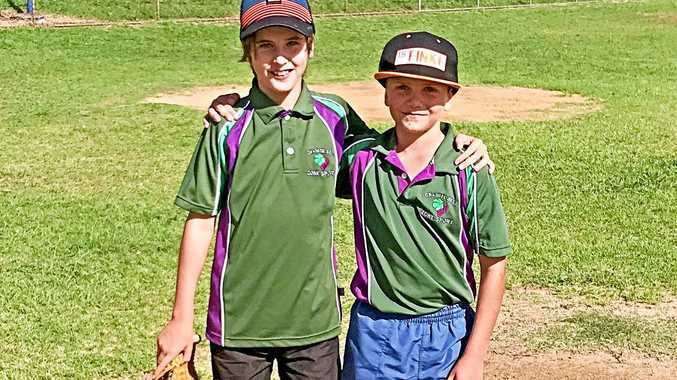 Braylen has been learning the ropes of softball during interschool sports, representing Thulimbah State School. "Thulimbah just won the pennant league softball the Friday prior to the trials,” Jodie said. "This is the first time that Thulimbah has won a softball pennant and the first time they have won any pennant in over 20 years.